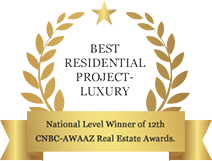 “BEST RESIDENTIAL PROJECT- LUXURY” - National Level Winner of 12th CNBC-AWAAZ Real Estate Awards. Wouldn't you like to make your home in a place that is in harmony with Nature, the wind, the water and the trees? Where you look out on magnificent views that quiet the soul. Just as the name suggests, Embassy Pristine is about living the good life, yet minimizing your impact on the environment. The inspiring balance between green living and upscale urban luxury; the fruition of this living mantra comes to life here, in all its lake-front green glory. Embassy Pristine is ready-to-move-in and is already home to a discerning, eco-conscious community. A world in itself, Embassy Pristine is where luxury meets lake-front. As the apartments here begin on the second floor, every home gets treated to splendid lake views. Located 800 meters off the Outer Ring Road near Koramangala and spread over 14.5 green acreage. The property is enveloped by acres of verdant green defense land on two sides and a placid lake on the other. The club, the biggest yet in Bangalore and the sports complex together presents engaging perspectives on life and leisure. Unwind at your own pace, reboot your social life, play gracious host to friends and family amidst the easy, elegant ambience. With the promise of extraordinary experiences, exquisite rewards and enriching relationships, the Embassy Priority engagement program is designed for the true believers of good life like you. I find that we are thoroughly enjoying the greenery of the Army Range, on the one side, and the glassy waters of the lake on the other. The general staff here is conscientious & courteous, though the Security staff deserve a special mention for being really excellent & diligent in carrying out their duties as pleasantly & strictly as they should! I would observe that it has much to do with the selection process and in-house Supervision. The promptness with which the Group attends to any problem cropping up, or deficiency, is laudable and definitely indicative of the Management's active interest even after us moving in: and definitely worthy of mention & appreciation. Finally, the manner in which all the General Amenities are already functioning here make me optimistic & thrilled to anticipate the future promised Facilities, like the functioning Restaurant & General Grocery Store, etc. I must conclude by saying that after spending almost forty years in the open green fields & fresh air of the Farm we have made the best & right decision of moving to Embassy Pristine. Its been eighteen months I shifted to my new house seems like yesterday when I visited the site to see the model apartment and in a span of few minutes I decided with my daughters this is the kind of place I have always wanted and there is absolutely no second thought. I am on the fifth floor and my flat is facing the forest area so all I see is greenery from the living room and the bedrooms, the beautiful sunrise and sunset. No traffic pollution, no noise. Its a perfect choice and place to lead a good retired life. The staff here is very professional, helpful and prompt in answering any query. security is excellent. Overall a very good package. This is my first experience of living in a gated community. I thank EMBASSY GROUP for coming up with such an excellent project. Its been quite a journey till I completed the registration and possession recently. Overall extremely happy with our new home. Given that I was overseas and my requirements have been on multiple issues; the team has been fantastic on response time , succinct in communication and always provided a feedback/solution/update. Customer connect being a key driver which you have always been in the forefront , your team typifies it. Thank you. Wish the entire Embassy Group the very best.